Gardening in Florida means, among other things, that our garden centers are open all year long. Not only are they open but they offer brightly colored, potted up annuals for easy transplant and instant pizzazz any time your little heart gets a hankering for a pick-me-up. As my garden has expanded, over the years, I can look back and see the trend away from this temptation for instant gratification. In recent years especially it has been more toward a concentration on leaf color, textural significance, size and form, and variations of shapes and structure. I find my interests and my specifications for plants changing as time goes by as well. 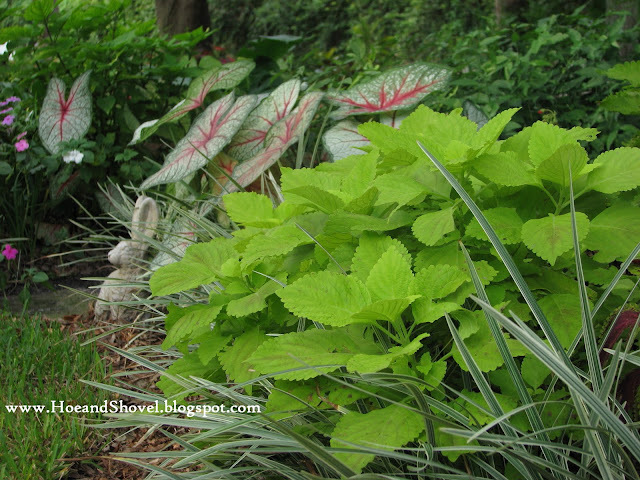 For example the past few seasons an emphasis on native plants and Florida-friendly combinations has been foremost. The attraction to them seems obvious. They adjust well to the natural environment when placed correctly. They require less fuss and attention once established. They attract and feed local wildlife. They continue to give year after year. Recently I gave into my lust for showy foliage and purchased a couple of false banana plants. I've never been a big fan of the gigantic green variety we see (overgrown) everywhere in this region. 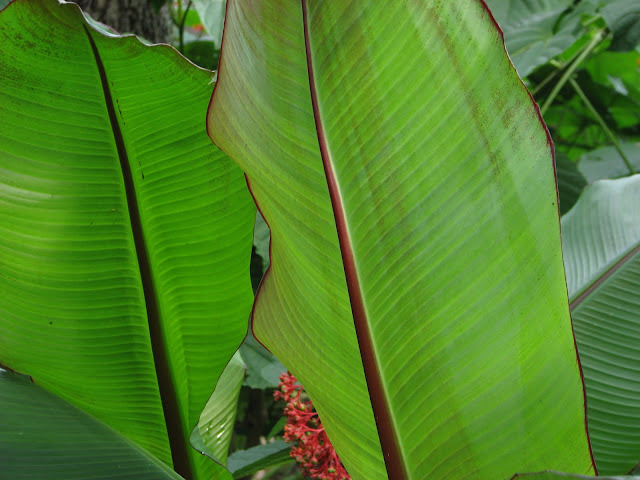 But the Red Banana has a unique magenta veining and edging on their enormous paddle-shaped leaves that I find irresistible. Some of the commonly used plants in this zone are easy to take for granted. And yet many of them have served me well for many years. Schefflera arboricola 'Variegata' roots easily from cuttings which means only a few were purchased initially. The rest have been cultivated and planted. They do well here, pinched back and kept bushy, adding to the lush understory of the oaks mixed with Cyrtomium falcatum holly ferns, Philodendron 'Xanadu' , gingers, Plumbago auriculata, caladiums, coleus... they are just great foundational plants that require almost no attention and yet give us great color and texture. One of my favorites when sited correctly. My taste in design has evolved as well. 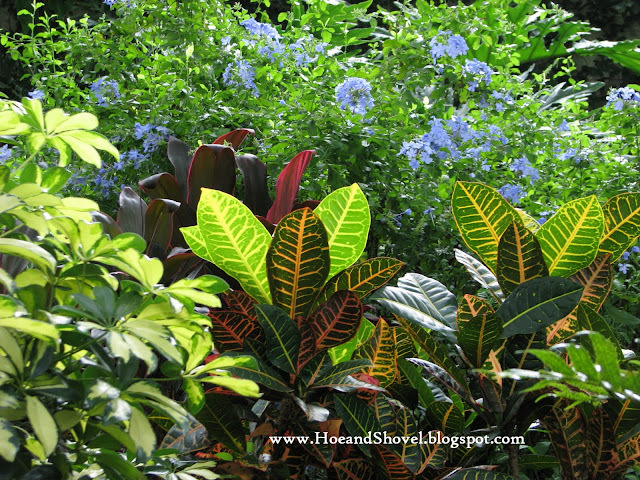 I'm doing my best to learn the delicate blend of tropicalesque with Florida-friendly and native plants. I'm also experimenting with a more natural or untamed look in specified areas of the garden. Planning for and allowing plants to flow with their natural growth patterns. Within reason of course. At Hoe and Shovel it just wouldn't ever work to be completely untamed. My goal is to keep plants within their boundaries enough that they don't tangle with their neighbors. 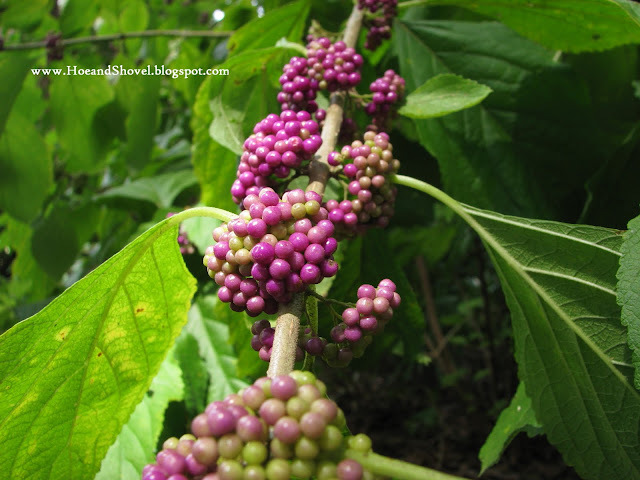 Here the native Callicarpa americana, American beautyberry borders a pathway adjacent to the tropicalesque Alpinia zerumbet 'Variegata' , Variegated Shell Ginger (below) and Cordyline 'Red Sister' plants known for their intense color. These plants are repeated in places throughout the understory having become foundational to the look and feel of this garden. Gardening develops the gardener as much as the garden don't you think! Experimenting with having less flowers and more and more foliage for color has been a gradual thing. But I have to say it brings much delight as the transition from worrying over blooms to the peaceful state of my shady foliage garden evolves. While Florida doesn't necessarily have some of the vibrant foliages I've seen in more northerly gardens, we are learning to work with what we can grow here. Mixing them up and blending them for the best visual appeal that stays perky all year long is the constant goal. The architectural structure of the large oak trees lays the ground work and provides the protective covering for many of the more tender tropicals. One of my favorite Cordylines that I cannot remember the name of. 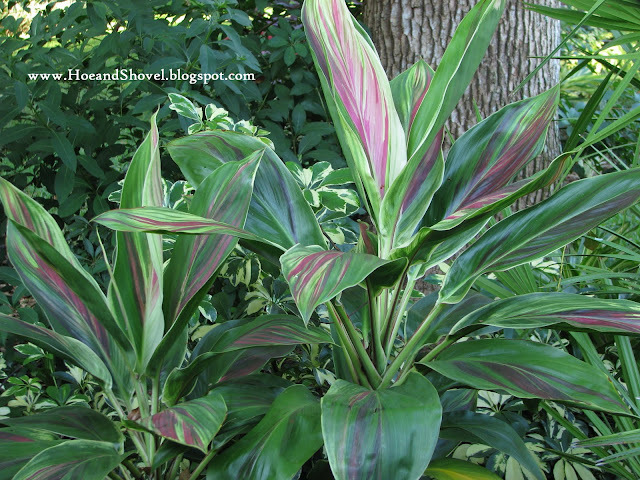 It has lighter pink streaks and light lemony colors streaked with yummy greens. 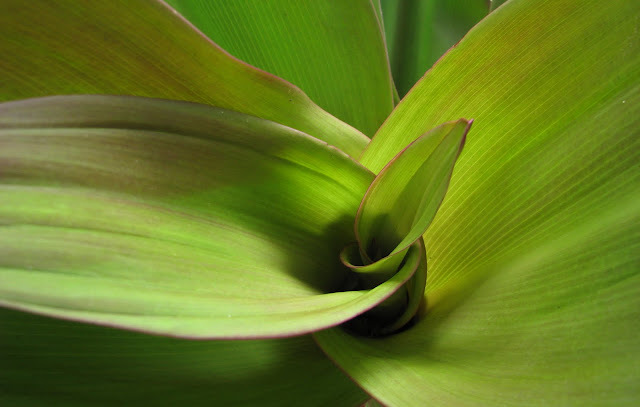 All Cordylines root quite easily by cutting the tops out and poking into newly potted up soil. 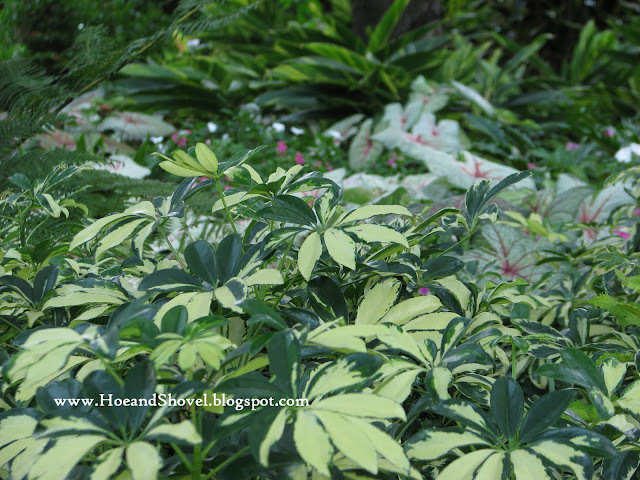 Foliage that flourishes year round is the preference in most cases. 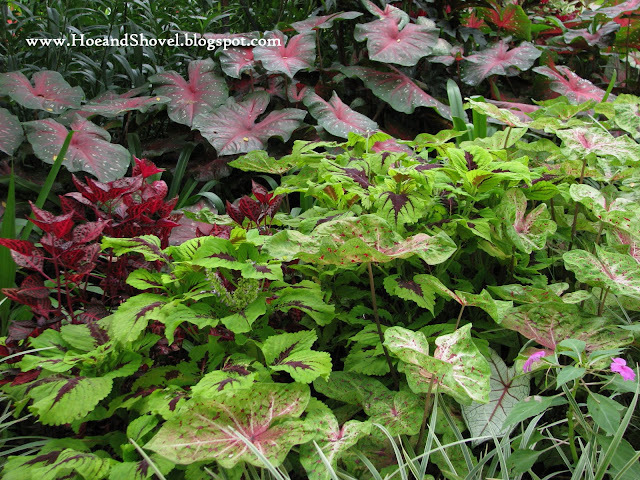 Although we rely heavily on varieties of coleus and caladiums for many months out of the year. Even these are intensively planted in between the standards that don't fade away with changing seasons. Another variety of Cordyline passed along to me by my neighbor. Again, we started with one and now have numerous fast growing clumps of variegated color by cultivating and planting more as we've grown. It dawned on me this spring to divide and transfer a few of these begonia from the front walkway. A gift from a neighbor over ten years ago they are thriving in more than one place now adding a tropicalesque flair to a vignette in the front garden. 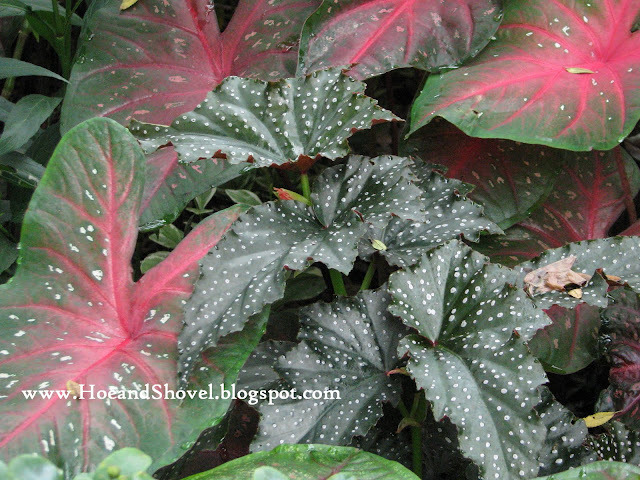 Begonia heracleifolia, Star Begonia was recently added to a nook in a curvy path in the back gardens. Placing ordinary houseplants right into the ground has become a habit just to see how well they grow. For the most part they seem happier where their roots can spread and their heads enjoy the natural light. Layers of color where virtually no flowers are present have become common place. 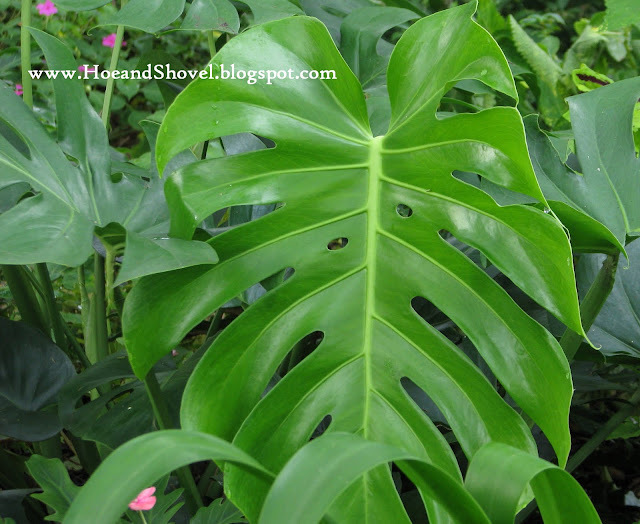 Adding large mosaic-leaved plants of Monstera deliciosa Liebm. 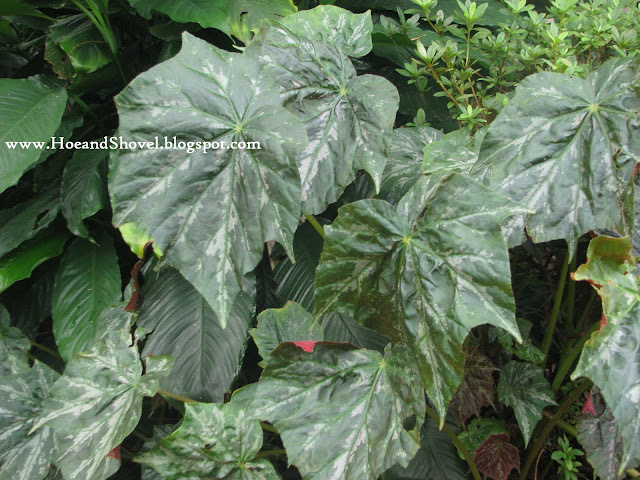 (sometimes sold as Philodendron pertusum) with grand stature in the midst of simple greenery works well, too. Crotons are not my favorites. In Florida they are super-over-used. There are a few mixed in here and when the light shines through their leaves it is hard not to like the stained-glass affect and variations of color this one plant provides all on its own. Certainly we have not forsaken floriculture all together as an attraction to the butterflies and wildlife. But it is becoming more clear that the great majority of this garden's basic structure is not dependent on blooms ... as much as we enjoy their glory and wonder. Pseuderanthemum 'Black Varnish' offers a very deeply hued and lush leaf among the native Zamia floridana coontie. Only a smattering of our favorite foliage plants have been highlighted here to give an idea of how they work tirelessly for us around here. By no means could we include all of our preferred flora. Wow. You all are good listeners! Tell me, how has your garden or gardening emphasis evolved? i really like being the first comment though it doesn't happen often. meems...this is what your garden is all about...foundational plantings. i love that about your gardens. it always looks well established and lush. gardening does evolve as we change and what is important to us changes. i love the fact you are endeavoring to use more natives...it does just make sense. one day when my garden grows up i want a lot of foundational plantings. i love flowers but we definitely have seasons for those. i still find it hard to believe you have over 60 containers in and about your gardens...it is mind boggling. but it just gave me the greatest idea. i am going to go more toward this because of all the creatures i have roaming around in my landscapes. i always think i have to have the most beautiful ones but if i got some plain ones they would blend in anyway. 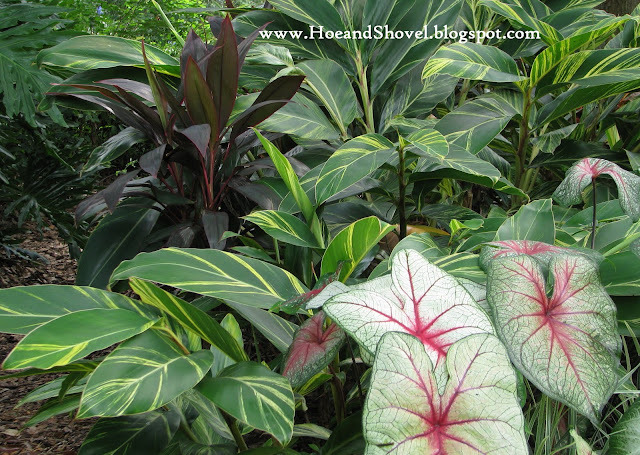 two plants that stood out to me were the red banana...it is great. the other is the black varnish...i love,love this one. i love this post it speaks of you in every turn. I think your garden looks amazing, so beutiful! I wish we had that weather of yours =) Now when everything is dying after a couple of frosty nights it's no fun at all. WOW is right! You are making all of us jealous. You see theme parks and botanical gardens that are the efforts of many that pale in comparison to your efforts of ONE. I like your descriptions and vignettes of "tropicalesque" and your native plant affection. You are a master of Right Plant - Right Place. My own gardening is an evolution of finding the best place to enjoy way too many plants I like and learning from trial and error. I am always wishing I had done more with the bones of my garden and planted better trees in place of water oaks and weak laurel oaks that are problematic and not as long lived. What a wonderful display of foliage and structure! I can't decide which is my favorite as you have so many perfect plants. I am so envious... full sun and deer restrict my foliage plants significantly. In fact, my garden suffers from "small leaf syndrome" because it is very difficult to find big leaves (other than magnolia) that can take the full sun. One can only handle so many ornamental grasses! OMG Meems you have such a wide variety of plants.Some I have never seen! That begonia with the large leaves is stunning. What are the blooms like? 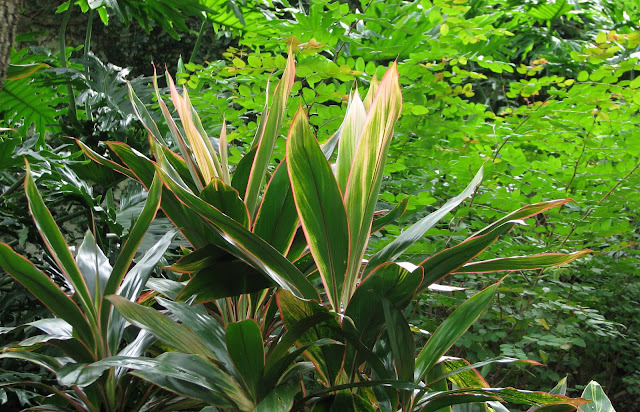 That cordyline is to die for! You have a very beautiful and well planned garden. You have strategically placed your foundation plants where they will be at their best advantage and then filled in with softer plantings that compliment them.You have given me some great ideas on how to create some structure in my garden beds in future. Very good post! Have a great weekend. Lovely display. Cool air is headed this way and I'm dragging tender tropicals inside for the winter, envying that you don't have to do that. Many will just die back to return next year, but some are happier brought inside. I take cuttings of iffy things like pentas, which may or may not return. I agree with your thinking about bananas. HI Meems, They say that George and I should write a book about our hiking and waterfall experiences---but YOU should write a book about Florida Gardening. WOW--you know so much and have a fabulous garden. We're headed to your state today--going to my brother's Memorial Service. Wow I am stunned by all of the different variegated and textured plants you have in your garden beds. With all of them one has so much beauty without blooms. 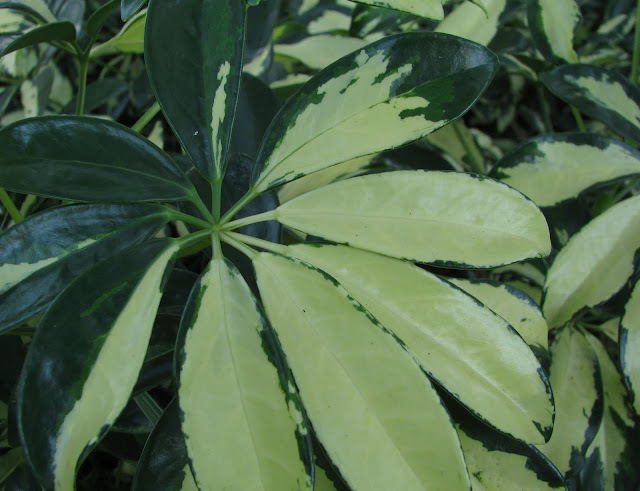 I love the variegated Schefflera arboricola, just gorgeous.The wide stripes of white or cream is what really catches my eye on it. Loved your post again, as always...Just wondering, when you root the cordylines, do you stick them in a pot and then transfer them back into the garden or go straight into the garden with them? Almost all of the tropicals I have had in my house at one time or another. It always makes me wish I could grow them to look as lush and beautiful as you do in your garden. So many variations of leaf size, structure, color. Endless enjoyment. My poor garden is showing the ravages of cold, wind and rain. No much to please the eye right now. Meems, you have everything in this garden - shapes, colors, textures plus you have location, location, location (I mean Florida)! 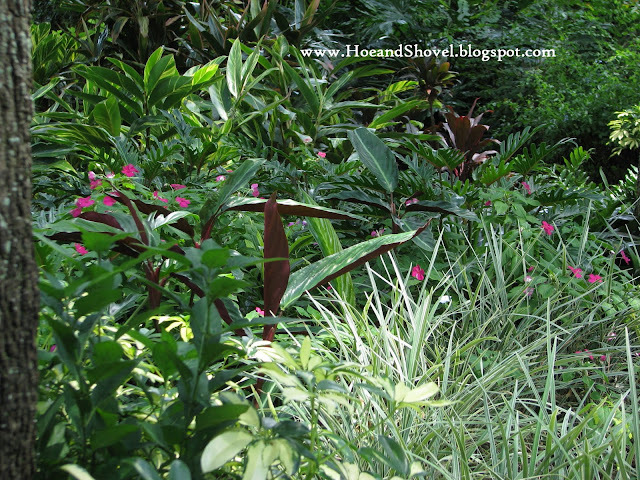 Tropicals are wonderful, and you make wonders with them in your garden.It's always a treat to see your place. 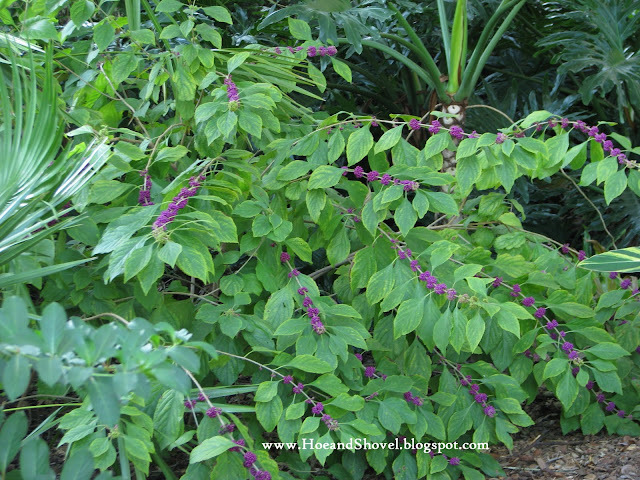 I have learned so much about gardening here in Florida through your blog. Thank you! I have a well deserved Kreativ Blogger award on my web site for you, if you would like to collect it. I think your blog is terrific! A place where the garden center is open all year and the garden is growing all seasons, well, I can only dream. Such fantastic combinations of colorful plants, Meems. Whoever said, " What is paradise, but a garden ? " must've been from Florida. Belated Congrats on your Blotanical award, which is richly deserved. very nice post Meems. I love your foliage combinations. What a cute little froggie! I've definitely become more interested in foliage the last few years, and more recently have been adding more natives to the garden. I'm commenting before I go back and see if you had color from blooms or simply foliage. It just went on and on, one beautiful spot after another and I'm thinking it was almost entirely foliage. In any case it's just lovely! I think we do change as we grow as gardeners...we learn to control ourselves a bit and we learn what we really like. And we always need to have that something new to try. Your posts always give me lots of ideas! 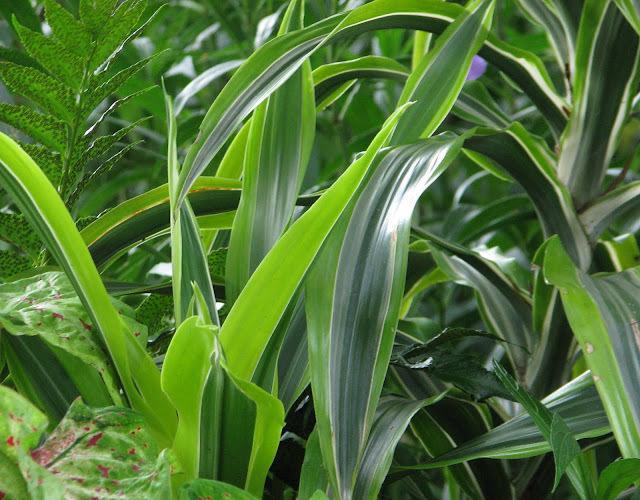 All the foliage plants in your post are very suitable to our climate as well. I agree that preference of a gardener change with passage of time. Does your Monstera deliciosa yield fragrant blooms? 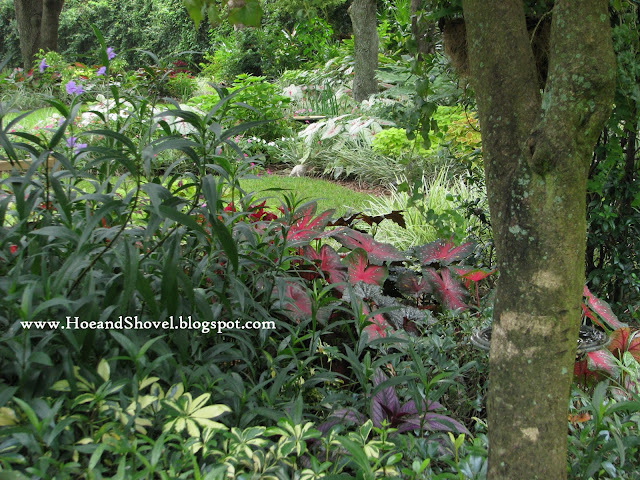 Lately, I had been thinking how much garden ideas change over the years or over the life of a gardener. 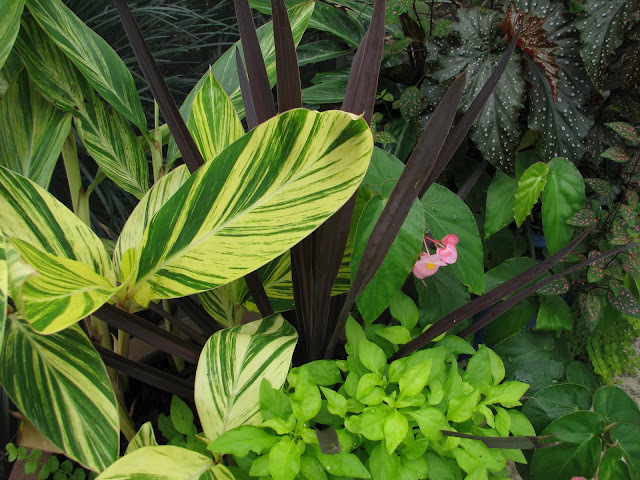 You are blessed with lots of choices in foliage plants. In the north, not so much choice especially in shade. Our native plants tend to bloom and then either disappear or look unkempt the remainder of the season. In my garden, annuals are the great masker of declining perennials. Wish we had a larger choice of attractive foliage. Hi Meems, Loved the post. Your garden is luscious looking as always. I'm glad to see that you are getting some plants that don't bloom. For some unknown reason seems that my gardens have always been on the foliage side, not blooms. I have just this yr. tried to include some blooms as I have no pollinators. I've learned no blooms, no pollinators. Or so it seems here. What is your idea on that? Thank you first of all for all your kind encouragement... it means the world to me. That black varnish is one of my faves, too. I've been snipping away at it and potting up cuttings in container plants as well as transplantable pots. It won't take any frost so if we happen to have any this year I will not be without this plant when spring comes around. Blending in the containers with the landscape is good for portability, too. If you decide to spruce up different area you can just move them around. I was so reluctant to buy those red banana but I got them for $5 each (crazy September sale) and I can't tell you how much I've enjoyed looking at their giant leaves. Happy autumn to you, too. hugs. Thank you. There is always an up side and a down side. Our weather is not the easiest to garden in during the summer but now when other's gardens are going to sleep~~ Florida is still giving us sunshine to grow by. Not you! Way too many plants? If I had your life I probably wouldn't know what to put where with so many flowers at my fingertips. We have the same trial and error teacher in common... it is a good one and fortunately with our continual growing season our mistakes can be restored fairly easily. Thank you for all your kind words... it is a lot of work but the joys are much greater. You make a good point about small leaves. I hadn't really thought of how it is difficult to find larger leaves that enjoy the sunshine. You have so many perfect flowers and combinations no one will ever think about the size of leaves in your garden. Thank you for your kind compliments about my garden. You are a dear. I so wish you were here now. Don't you love the cordylines! So much to offer in one lush plant. The stats say they don't do well here but my little micro-climate defies the odds. Hugs to you dear lady... your kind words are treasured! My neighbor two doors down has some giant (at least 25' tall)bananas bordering some cypress that I get to 'look' at from a distance. They are gorgeous this time of year. So often folks put them in the wrong place and they stay tattered and ratty in appearance. I hope all your tenders are staying out of the cold. You all got the cold long before us. What a great idea for you and George to share your memories and images in a book. My heart and prayers have been with you these days ~~ I do hope all went well in Jacksonville. The Arboricola has served Hoe and Shovel faithfully in so many ways. I'm even growing it in a hanging pot... just wanted to see how it would fare and it is happy there as well. The cut branches make an untraditional but excellent addition to fresh flower arrangements as well. I am so sorry it has taken me this long to get back with an answer. Life. It is the thing that keeps me away from blogging. Ha. I have rooted the cordyline plants both way. Way back when my neighbor gave me my first one I simply stuck the stalk in the ground and kept watered they will do fine that way. Now that my garden has grown, it's better for the plant and for me (to keep them watered until rooted) to root them in pots first. They are quite cooperative either way as long as they are kept moist until roots are established. Happy day to you. You DO love your tropicals. Isn't it nice you can enjoy them inside at least. Thank you... it is always a pleasure for you to visit. Living in Florida certainly offers lots of variety... and warmth and sunshine for growing. So glad to 'meet' another fellow Florida gardener... and thank you for the kind award. Paradise? Hmmmm... if sweltering humidity is paradise then I'll bite. LOL... I DO love my Florida gardening. I'm always so thrilled when someone comes to visit Florida and falls in love with it. You planned that last trip just perfectly it seems since you are a busy grandma now... come back when you can. Thanks for dropping by virtually until then. The differences are most noticeable as we enter this season of rest for your northerly garden. You, by the lake and visiting wine country... Me, still in the garden. Hmmmm??? LOL Enjoy, dear friend! Thanks for saying hello and your kind words. Enjoy this wonderful weather we are having. The bones of my garden have always been the trees and the native palmettos I started with... it has taken me many years to learn and develop layers of foliage. Since I've been at this for so long I appreciate more & more those plants that endure ~~giving long lasting effects. But I still mix in some annuals now and again for pop... it's just so easy to do in Florida. It's nice to learn what we like and what works (and doesn't) in our gardens. Natives need to be sited correctly for optimal production just like any other plant. But when that happens they make great additions to the garden. So glad you are well again. The 'complete package' is a good way to describe foliage plants. They do give us color year-round and you can't beat that for the price. Great to see you. It seems as we mature in life and gardening our direction is more focused. The natives are great for so many reasons and Florida offers an extremely wide variety to choose from... then there are those Florida-friendly plants that aren't necessarily natives. My goal is to learn how to use both a little better all the time. I imagine California is much the same. Also, like you said... there is always a place for those things we just 'have to have' or want to try. Many of our plants originated from your region or close by ... interesting we have similar plants. My Monstera was added last spring... will look for fragrant blooms... what a bonus. yay. You've enlightened me in the ways of northerly gardens I didn't realize... 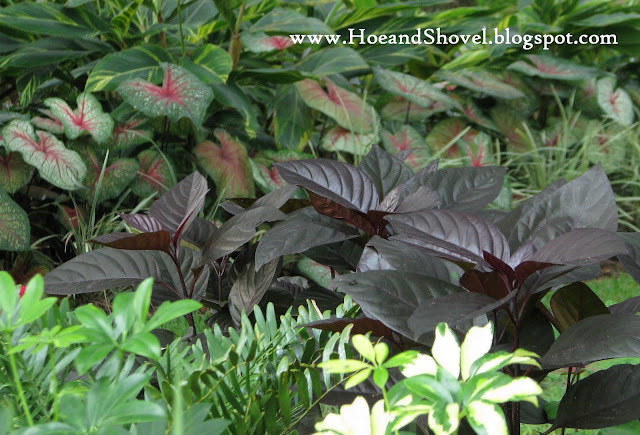 I see so many vibrant foliage plants on blogs it makes me envious at times. We always want what we don't have ~~ I suppose it's human nature gone awry. Interesting about your choices for shade. Yet (filtered)shade here is what allows for variety. So different. The pollinators definitely go for the blooms. For year round blooms I have lots of pentas, ruellia, lantana, porterweed, salvias, firebush, and then I plant zinnias, blanket flower, cosmos, from seed each spring ... then there are the perennials that bloom in their own season... incorporated into the foundational plantings. No, we can't be without the flowers or you miss out on the joy of pollinators. If I counted correctly you are asking about the Snow bush. It isEuphorbia Breynia disticha and likes a good dose of sunshine to turn the tips of the foliage pinkish white. It is hardy in Zone 10-11.